The history of agriculture and education in the state of Pennsylvania changed forever on October 26, 1859. 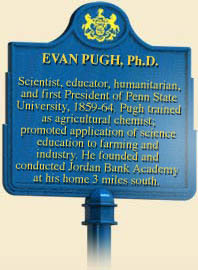 It was snowing lightly that day when Evan Pugh arrived at the "Farmers' High School" (later renamed the Pennsylvania Agricultural College and then Pennsylvania State University) to be the school's first president. Pugh brought something new to agricultural training - science. At the time, most agricultural academies in the United States focused on teaching students how to farm. They provided plenty of manual training but little in the way of scientific investigation. Convinced that agricultural schools could play a major role in the advancement of agriculture in Pennsylvania, Pugh argued that while major efforts had been undertaken to apply scientific knowledge to "the learned professions and industrial arts" and make "those who follow them familiar with scientific principles, the education of the agriculturalist has been in this respect almost entirely neglected. And yet there is no branch of human industry involving more scientific principles, in the practical operation of its various departments, than does that of agriculture." 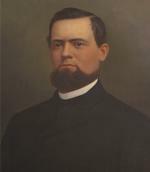 Dr. Evan Pugh, by William A. Greaves, 1890. Evan Pugh was born on February 29, 1828 in Oxford, Pennsylvania. When his father died, Evan the oldest son at twelve, helped his mother run "Jordan Bank," the family farm. After receiving a formal education and manual training at a school in upstate New York, Pugh returned home to teach elementary school and help on the farm. In 1853 his mother left Jordan Bank to him and moved in with one of her other children. Pugh loved the farm and enjoyed conducting his own scientific experiments with fertilizers, but rather than stay and settle into the life of part-time farmer and schoolmaster, he sold the property and used the money to further his education. Since the best science schools in the world were in Europe, he packed up his valuables - a "box of minerals weighing 100 pounds, a chest of books and pressed flowers of 60 pounds, and [a] trunk of clothes" - and took a steamer out of New York City to study chemistry in Germany. After completing his doctorate at the University of Gättingen in 1856, Pugh did post graduate work at Rothamstead Experiment Station in England where he conducted important research on how grasses absorb nitrogen, research that attracted the attention of scientists in America and Europe. His meticulous study earned him recognition from the American Philosophical Society in Philadelphia and Chemical Society of London - both organizations made him a fellow. In 1859, at the age of thirty-one, he declined an invitation to stay at Rothamstead, instead accepting the presidency of the new Farmers' High School back home in Pennsylvania, located in Centre County near Boalsburg. As president of the school and professor of Chemistry, Scientific Agriculture, and Mineralogy, Dr. Evan Pugh was a dynamic force. He worked with the trustees and state legislature to change the name of the school to the Agricultural College of Pennsylvania to make it eligible for federal funds under the 1862 Morrill Land Grant Act which provided government money from sales of lands in the west for the establishment and maintenance of one college or university in each state to teach "agricultural and mechanical arts." He urged the Pennsylvania Assembly to designate the college as the state's only land-grant institution and thus make it the recipient of federal money. He also changed the curriculum of the institution. In addition to the practical, "hands-on" training in which students learned how to plow with horses, use various types of farm machinery, care for livestock, raise plants, and transplant seedlings, Pugh added chemistry, geology, higher mathematics, and mineralogy. He also added laboratory experimentation and research to test scientific theories about plant growth and other agricultural concerns. He funded the school's chemistry lab with his own generous donation of $500 for equipment and contributed $1,000 to the construction of the president's house. Pugh regularly met with the board of trustees and performed countless other duties -as the student advisor and disciplinarian, head of the faculty, and acting secretary of the school. In the latter role he calmed creditors, answered inquiries, and ordered books, construction materials, and equipment. He also introduced a course of graduate study at the school, which led to the granting of a Master's Degree in Scientific Agriculture in January 1863. In his spare time, Dr. Pugh continued his own scientific research, performing chemical analyses of fertilizers that proved fraud on the part of manufacturers. These and other studies he used to convince the state legislature to create an organization to enforce truth in labeling commercially produced fertilizers. Evan Pugh was only thirty-six when he died suddenly on April 29, 1864. Today Penn State honors him by bestowing the title "Evan Pugh Professors" on its most distinguished faculty. Michael Bezilla, Penn State: An Illustrated History (University Park: Pennsylvania State University Press), 1985. Michael Bezilla, The College of Agriculture at Penn State: A Tradition of Excellence (University Park, PA: Penn State Press), 1987.